This is where I am now. It is where I spent most of my time when I am at home. I have chosen the mosaic to represent the chaotic nature of online presence. I know I am here but not always here. I am here and also at many other parallel universes. 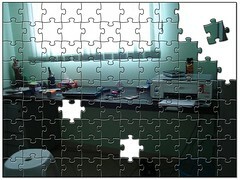 I guess the missing and the visible pieces represent these many possibilities of being at many places at one time. I live by myself, so I guess I spend a lot of time in contact with people that are physically so distant. Sometimes connected to this people online, sometimes planning lesson for people I will see only tomorrow or the day after. It is funny to think of the many ways we are connected to people. Your post is so interesting and thought-provoking. What came to my mind while reading it was that life is full of paradoxes: you live alone but you can be connected to people from all around the world anytime you decide to turn on your notebook. Being physically in your apartment and present at the "...parallel universes..", as you call them, at the same time. The web world is still chaotic to me, but when I "see" things through your work, everything seems so organized and the paths become clearer. I guess what I´m trying to say is that it´s a though beginning start a new life, in a new world. Life is indeed full of paradoxes. As you get more familiar with the web, you will get to like this chaotic nature of being connected.